TUNISIAN RAILWAY - railmeds JimdoPage! _ Its share in the Gross Domestic Product (GDP) is 6%. _ Its added value amounts to 1.67 billion Euros or 31% of the value generated by services. _ It employs 120,000 people hence 3.9% of the labor force. _ It absorbs 15% of the country’s investments with more than 50% made by the private sector. _ The average annual growth rate is 5.5% for the 2002-2008 period. _ About 22,000 kilometers of classified roads and 400 kilometers of highways. essential factor for economic and social development. _ Ministry of Interior and Local Development (MIDL) particularly responsible for road traffic. 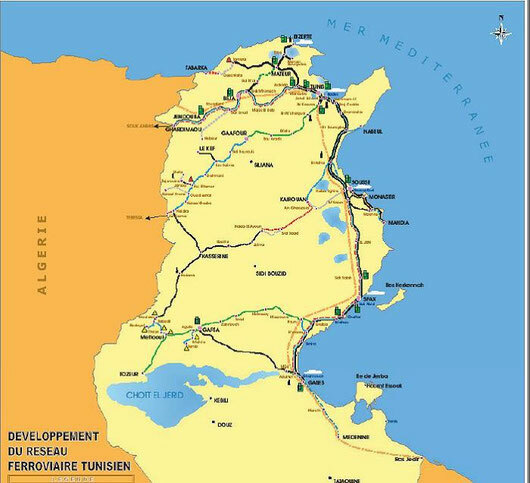 The Tunisian railway network covers 2,165 km including 1,991 km in operation, 673 km of which solely used for freight carriage and 1,314 km are used for passengers as well as for freight. 1,686 km of the tracks are metrically gauged while 471 km are normally gauged (1.435 m), and 8 km have double gauge. _ Transportation of goods: 8 million tons of phosphate and 3 million tons of various products. SNCFT holds 8 logistical platforms for the rail-road combined transportation. _ Chronic deficits due to the State defined pricing policy with no consideration to production costs. _ The massive financial transfer from the State to SNCFT. _ Superabundance of employees resulting in a massive payroll compared to revenues. _ A heavy organization structure with consequent structural expenses. _ Existence of an important potential poorly prepared for competition. institutional handicaps (absence of a framework defining the Company’s relation with the State). _ Transportation of passengers on long distance main lines, on the Tunis-Gabes and Tunis- Ghardimaou routes (Libyan and Algerian borders). - Operation of suburbs’ passengers services, economically and socially justified in the frame of a public service agreement. - Payment by the State of infrastructure costs, either directly through the State Budget or by reimbursing credits granted by lending institutions. _ Coverage by the State budget of reimbursement annuities. _ 1,200 agents during the 2002-2006. The staff was then reduced from 9,000 in 1991 to 4,800 at the end of 2008, hence improving the personnel/turnover ratio, by reducing it from more than 75% to 52.4% now. Reorganization operations aimed at reducing the railway transportation costs and improving its competitiveness, and consequently enhancing the railway activity attractiveness. - Law n° 98-90 dated November 2, 1998, related to SNCFT. services according to a Specifications Book. Decree n° 99-2318 dated October 11, 1999, approving the franchising convention of railways public domains concluded on September 9, 1999 between the State and SNCFT. The railways public domain business unit constitutes the beginning of the distinction between State owned infrastructures and railway services conducted in the framework of an SNCTF franchise. In accounting terms, infrastructure and operation are independently identified but both are included in the financial balance as much as other fixed assets mainly the rolling stock. Separation was made in general accounting terms since promulgation of the 1998 concession law, granting the operation of SNCFT’s Infrastructure in the form of franchise. (railway network) and SNCFT transportation operators (freight, phosphate, main line trains, Tunis and Sahel suburban trains) split in different business units. Reforms resulted in SNCFT’s financial balance after many deficient years, bank debits and unpaid charges. The State compensated tariffs reduced in suburban transport lines and respected related convention in 2002 based on a formula used by the Ministry of Finance to determine the compensation amount. The company was able to reverse the drop of goods transportation rates and develop other activities such as the container carriage services. Over the four previous years, the railway activity (unit-km) increased at annual average rate of 1.9% including 4% for passengers transport and 0.5% for the transportation of goods. Nonetheless, this activity represents 14% only of the global goods transportation business and 5% only of passengers’ transportation services. As for freight, the most appropriate railway line is the North-South corridor, connected in the North to the Algerian and Moroccan networks, and can be extended in the South to Libya and Egypt. This line represents a major component of the Euro-Maghreb freight corridor discussed in a symposium held by UIC in Tunis on November 17-18, 2006. This line will be connected to Europe’s South shore through the sea highways "Marseille-Tunis (Radès Port) and Genoa-Tunis (Radès Port). The deep waters port Enfidha will increase Euro-Maghreb maritime highways through the Mediterranean. Socio-Economic Development Plan Period (2007-2011) was mainly based on results of different sector-based and strategic studies and on deficiencies noted during the previous period. _ Development of multi-modal transport. The 11th plan adopted the railway transport as a strategic choice and an inevitable solution to congestion and energy consumption problems, hence reducing pollution, preserving the environment and enabling the rapid expansion of traffic in good comfort and safety conditions. (2002-2006) then amounting to 410 MD (230 million Euros). - Equipping grade crossings and improving stations’ conditions. - Reinforcing engineering structures and bridges. - Signaling and communication projects. The Tunisian railway system suffers from a major handicap as it is made up of 471 km of normal gauging lines and 1,686 km of metrical gauging tracks. The Tunis-Algerian Border line is a normal track line and does not raise any major connection issues with Algeria and Morocco. However, its connection with the southern network and the Libyan border shall be with a metrical gauging system, which raises the North-South connection problem, and also with the future Libyan network, which will be normally gauged. _ French standards and UIC forms with PRS type split switching stations and computer interlocking stations (PIPC). _ 2x25 KV alternative electrical traction (Tunis suburban line ad of the end of 2010). _ Maintenance of equipment: specifications according to suppliers’ documents, according to cycles adapted to Tunisian weather conditions and to line itineraries. International standards (Frame relay networks, IP Protocols). Tunisia does not offer a national authority in charge of railway safety. commission’s work is regulated by internal procedures defined by instructions given by the General Management and a central commission which members are appointed by the General Manager chairing the commission. Article 50, said law states that in case of serious accidents or incidents, the Minister of Transport may issue an order to launch an administrative investigation. In this framework, he shall also define the mission and composition of the investigation commission. In 2008, the tram’s global traffic served 120 million passengers including 45 million school students. The State compensates reduced tariffs and funds infrastructure investments. _ Respond to high travel demand on the main transport corridors. _ Try to maintain the present global share of public transportation in overall motorized travels. _ Compensate the tramway lines’ shortfalls. _ Serve the third belt surrounding Tunis area in acceptable conditions. _ Ease downtown congestion by reducing the traffic of buses and private cars, which involves resorting to new and efficient bus transportation modes serving the Grand Tunis area’s suburbs, and the construction of peripheral dissuasion parking areas for private cars. The decongestion of the city center will also be made by facilitating transit through new lines. electrified railway lines using exclusive lanes. _ The existence of railway funnels spared by urbanization that may be used to create an efficient railway network to serve the third belt. _ The existence of a railway line serving an important corridor (Southern coast) now being electrified. _ A relatively developed tramway line connecting the main neighborhoods of the second belt to the city center. _ A bus network complementing previous networks: local relations and periphery to periphery connections. _ Existence of sites in Tunis city center capable of hosting intermodal exchange poles. - A large capacity rapid railway network “RFR” to supply the 3rd belt areas and to “decongest” existing bus and tramway lines. - The existing tramway network complemented by additional lines. _ Bus infrastructure lines in exclusive lanes complementing the rapid railway network and the tramway network (90 km). _ Three central exchange poles (Place Barcelona, Tunis PV, Tunis Marine) and fifteen new poles in peripheral neighborhoods to develop intermodal connections and favor correspondences between railway and bus networks. _ Ten peripheral dissuasion parking areas offering capacity for 6,000 vehicles to encourage car drivers to resort to railways. A cross configuration has been adopted for the public transportation heavy network, correcting the present Y configuration of the tramway network and favoring exchanges between the city’s 4 cardinal points; one of the central exchange poles will be located at the meeting point of the cross’ four branches. The execution of the project will last fifteen years. The first operational portion will be achieved during the 11th plan for a total cost of 550 million Euros for a global cost of 2 billion Euros.